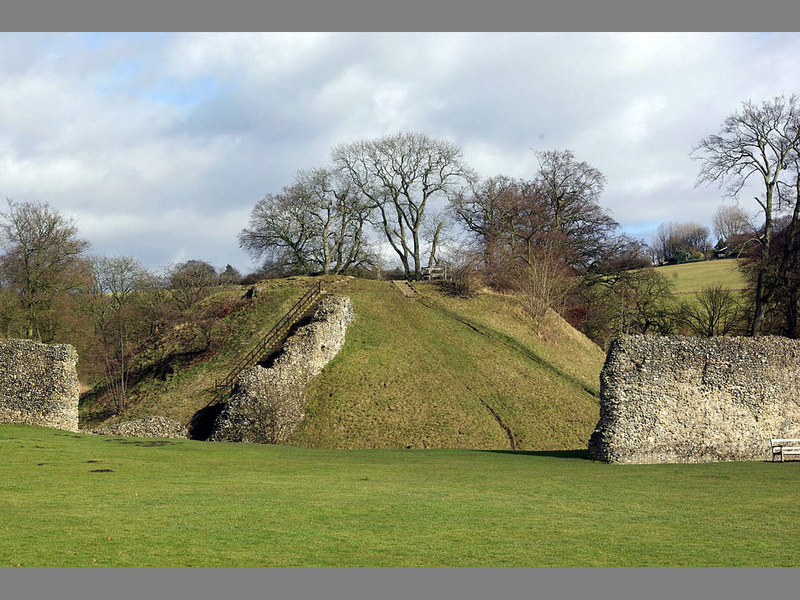 Berkhamsted Castle is a Norman motte-and-bailey castle in Berkhamsted, Hertfordshire. The castle was built to obtain control of a key route between London and the Midlands during the Norman conquest of England in the 11th century. Robert of Mortain, William the Conqueror's half brother, was probably responsible for managing its construction, after which he became the castle's owner. The castle was surrounded by protective earthworks and a deer park for hunting. The castle became a new administrative centre of the former Anglo-Saxon settlement of Berkhamsted. Subsequent kings granted the castle to their chancellors. The castle was substantially expanded in the mid-12th century, probably by Thomas Becket. Berkhamsted Castle was built during the Norman conquest of England in 1066. After William the Conqueror defeated the Anglo-Saxons at the Battle of Hastings he advanced from the coast, across the Thames Valley and north into Hertfordshire. Chroniclers suggest that the Archbishop of York surrendered to William in Berkhamsted, and William probably ordered the construction of the castle before proceeding south into London. Berkhamsted was strategically significant, as it lay on a key route into the Midlands from London through the Chiltern Hills. The actual construction work was probably overseen by William's half-brother, Robert of Mortain, who owned it by the time of the writing of the Domesday Book. The castle was located slightly away from the main road, to give additional space for the earthworks involved, and was positioned so as to benefit from natural springs running down from under the hill. It had a motte and bailey design, with a 40 foot (12 m) high motte, and a bailey around 500 foot (150 m) by 300 foot (91 m), enclosing 0.6 acres (0.24 ha) acres. A double bank and ditch ran around the whole castle, with both sets of ditches filled with water. In total, the wider earthworks occupy around 11 acres (4.5 ha). A fossarius – a specialised ditch digger – was recorded as being employed maintaining at the castle in 1086. A large deer park, owned by the Crown, was established around the castle to provide hunting grounds. The castle was carefully positioned next to the park, which was overlooked by the motte. A vineyard was also maintained alongside the castle. The old Anglo-Saxon manorial centre was moved to the site, and as a result the Anglo-Saxon settlement of Berkhamsted also shifted from the area now called Northchurch to the castle; several mills, essential for grinding flour, were present there in 1086. Robert's son, William rebelled against Henry I and the castle was confiscated. Henry granted Berkhamsted to his chancellor, Ranulf. In 1123, however, when Ranulf was travelling to the castle with Henry, the chancellor rode over the nearby hill, became overly excited at the view ahead of him and fell off his horse, dying from his injuries. The castle was subsequently given by Henry II to Thomas Becket when he became chancellor in 1155. Becket extended the castle to accommodate his large household, but fell from favour in 1164 and the castle was confiscated by the king. Henry II liked Berkhamsted and subsequently used it himself extensively. By the mid-12th century, the castle had been rebuilt in stone, probably by Becket, with a shell keep and an outer stone wall; the bailey was divided in two by a wall to form an inner and an outer bailey. A gatehouse led down into the town, meeting with Castle Street. Henry II also officially recognised the surrounding settlement of Berkhamsted as a town in 1156. Under King John the castle was part of the lands forming the jointure of his second wife Isabella. John entrusted the castle to Geoffrey Fitz Peter in 1206, who rebuilt much of the town. Geoffrey died in 1213 and the castle passed to his son, John Fitzgeoffrey. Political tensions in England began to rise, however, and a potential conflict between King John and an alliance of rebel barons opposed to his rule began to look likely. In early 1215, King John installed a trusted German mercenary called Ranulph in charge of Berkhamsted Castle and reviewed the defensive arrangements there that April. Civil war broke out later that same year. Initially, the rebels were hampered by a lack of equipment – in particular, siege engines – but in May 1216 the future Louis VIII crossed over the English Channel joining the rebel cause and being proclaimed king in London, bringing with him heavy siege equipment. King John died in October, and in December Louis besieged Berkhamsted Castle. The prince deployed his siege engines, probably trebuchets, and attacked the castle repeatedly for twenty days, throwing what chroniclers termed innumerable "damnable stones" at the defenders. 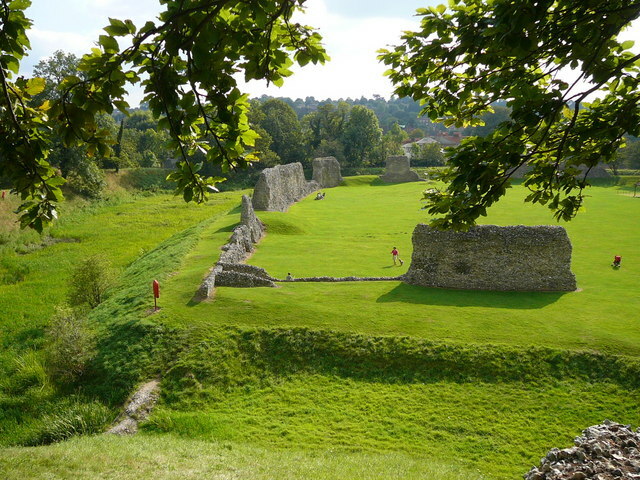 During the 13th century, a set of earthworks were built around the outside of the walls, which may have been the firing platforms for these trebuchets. Having put up a strong defence, the garrison was allowed to surrender and to leave with their weapons and armour. When the forces loyal to the young Henry III defeated the rebels the following year, the castle was returned to royal hands. In subsequent years, Berkhamsted then became closely associated with the Earls and Dukes of Cornwall. Henry III's brother, Richard, became the Earl of Cornwall and inherited the castle from his mother Isabella, and it became a permanent part of the earldom. Berkhamsted was Richard's favourite castle, partially because it was conveniently close to London. Richard had an impressive, three-storey tower built onto the property in 1254, and restored much of the rest of the castle; the chroniclers of nearby Dunstable complained that his building works required so many carts to carry the timber that local trade in other goods was badly affected. The castle was used for the central administration of the earldom and Richard's nine stewards would submit their annual financial reports there. Meanwhile, the town of Berkhamsted itself became rich as a result of the growing wool trade. Richard died at the castle in 1272, and it passed to his son Edmund. The castle passed on through Edward I, who found the castle in an apparently poor condition, and his second wife, Margaret, to Edward II. Edward II gave it to his royal favourite, Piers Gaveston, whom he made Earl of Cornwall. Gaveston was married there in 1307, with Edward in attendance. Edward II and Gaveston fell from power in 1327 and John, Edward's second son, took possession as the new Earl of Cornwall. When John died, Edward III reclaimed Berkhamsted Castle; a survey showed it to be in need of substantial repairs. Edward had not yet improved Windsor Castle, so used Berkhamsted as his main property, investing considerable sums in renovating it. His son, Edward, the Black Prince, was created Duke of Cornwall and also made extensive use of the castle, which formed part of the new duchy. The Black Prince took advantage of the aftermath of the Black Death to extend the castle's park by 65 acres (26 ha), including some woodland pasture stretching over the Chilterns, eventually producing a park covering 991 acres (401 ha). The castle was used to hold John II of France after he was taken prisoner at the Battle of Poitiers. When the Black Prince fell ill following his campaigning in France, he retired to Berkhamsted and died there in 1376. Richard II inherited Berkamsted Castle in 1377; initially the use of it was given to his favourite, Robert de Vere and, after de Vere's fall from power and exile in 1388, to John Holland. Henry IV lived in the castle after he deposed Richard in 1400, and he used the property to detain rival applicants to the throne. During this period Geoffrey Chaucer, later famous for his Canterbury Tales, oversaw renovation work on the castle in his role as a clerk. Both Henry V and Henry VI owned the castle, the latter making use of it until his overthrow in 1461. Berkhamsted was confiscated by Edward IV when he came to power during the Wars of the Roses. In the late 15th century, the castle was occupied by his mother, Cecily Neville, the Duchess of York. By now the castle had become increasingly unfashionable, however, and was abandoned after her death in 1495. By the time that antiquarian John Leland visited in the mid-16th century, it was in "much ruine" and was unsuitable for royal use. In 1580, the estate, including the ruins and the park, was leased from Elizabeth I by Sir Edward Carey, for the nominal rent of one red rose each year. Stone from the castle was used to build Berkhamsted Place, a local school and other buildings in the late 16th century. The castle's park, which had reached 1,252 acres (507 ha) in size by 1627, was broken up in the next two decades, shrinking to only 376 acres (152 ha). The English Civil War of the 1640s largely passed Berkhamsted by, with the castle apparently playing no part in the conflict. In 1761 the wider estate and the castle were separated, the former being leased to the Duke of Bridgewater, while the latter remained in the direct control of the Duchy of Cornwall. In 1863, the surrounding estates and park were sold off altogether by the duchy to Earl Brownlow; Brownlow also agreed to rent the castle from the duchy for a nominal rent. In the 1830s, plans were drawn up to build the new London and Birmingham Railway. From an engineering perspective, the ideal route for the railway ran through the site of the castle, but concerns over the need to protect ancient monuments and buildings had been growing for several years, and the local Bridgwater estate were also keen to protect the local view from their buildings. The castle was ultimately specifically protected in the 1833 act that sanctioned the railway, forcing the track to take a route across the valley floor. Berkhamsted was the first building in Britain to receive statutory protection from development in this way. Nonetheless, the route still required the track to pass through the outer fortifications of the castle, a major engineering operation which was carried out in 1834, destroying the castle gatehouse in the process. The Office of Works acquired Berkhamsted Castle from the Duchy of Cornwall in 1930. The inner ditch was subsequently drained of water in the 1950s. In the 21st century it is operated as a tourist attraction by English Heritage, and historian Isobel Thompson considers it "one of the best surviving motte and bailey castles" in England. The castle is protected by law as an ancient monument. Berkhamsted Castle was extremely well defended, with two ditches and three sets of earthworks around the oblong bailey, and a further ditch around the motte. Although no worked stone remains on the curtain wall, its flint rubble core survives for almost the full circuit of the bailey. The outer defences also survive well, although the railway, built in 1838, has cut through the outer gate and earthwork defences. Access to the site is now from the south-west, but the castle’s main entrance was to the south, and would have opened to a wooden bridge across the moat. The remains of some of the structures that occupied the bailey, one of which was probably a chapel, survive on the west side. The substantial motte stands at the north-east corner of the enclosure, and commands impressive views over the surrounding area. On the top are the foundations of the circular keep, 18 metres in diameter. Within the keep is a well. No parking on site but charged public parking, not managed by English Heritage, is available close by at the railway station or in the town centre. There is very limited on-street parking on White Hill. The main path into and through the Castle is surfaced with gravel but is suitable for buggies and wheelchairs. There are some steps up onto the earthworks. There are no facilities on site but it is close to Berkhamsted town centre. The Castle is next to the rear entrance of Berkhamsted railway station and there are toilets at the station. Opening Times : April through September 10:00 to 18:00; October to March 10:00 to 16:00.